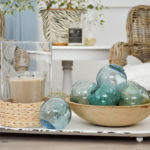 Do you have a space in your home that needs to work hard and function well, but traffic flow has to be clear and open? Me too! 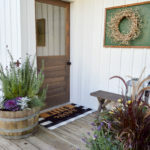 I bet our entryway in The Little Cottage is much like yours. You want it to work hard and store all those things we tend to drop at the door, or need on the way out, but we still want it to look good! MY SPACE: The entryway is 9 feet long X by 6.5 feet wide. Not huge, but definitely enough room to work with. THE LAYOUT: In this space, the layout of the room makes it a mini hub. 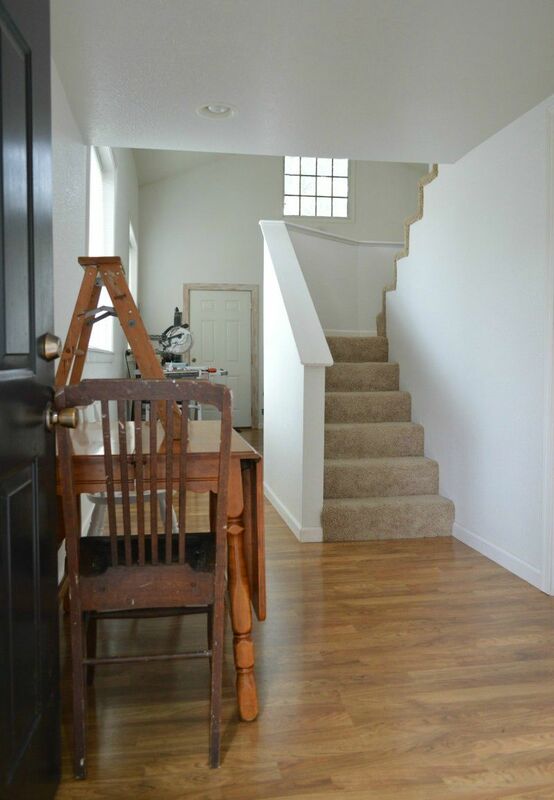 It has a switchback to the guest bedroom (behind and to the right), a door to the bathroom (pictured below), the staircase to the storage loft to the right, and the pass thru to the main living area to the left. 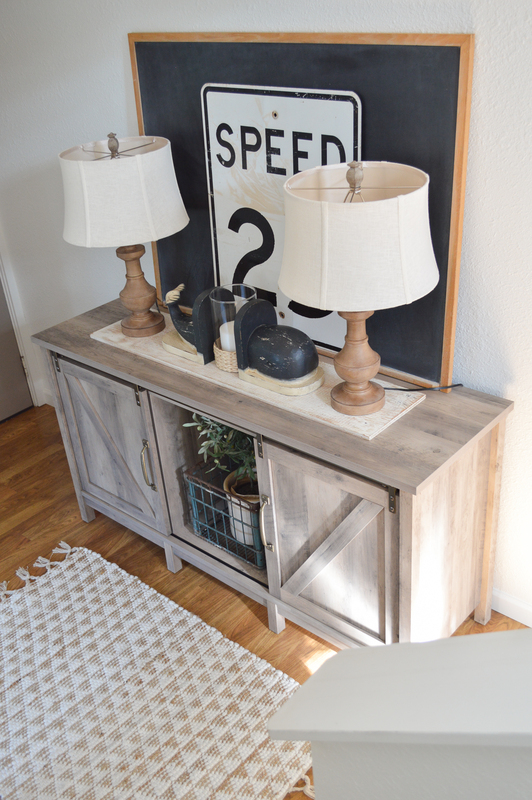 Because I “borrowed” the previous entryway piece and put it in the guest bedroom… and loved it there, I really needed to replace it. 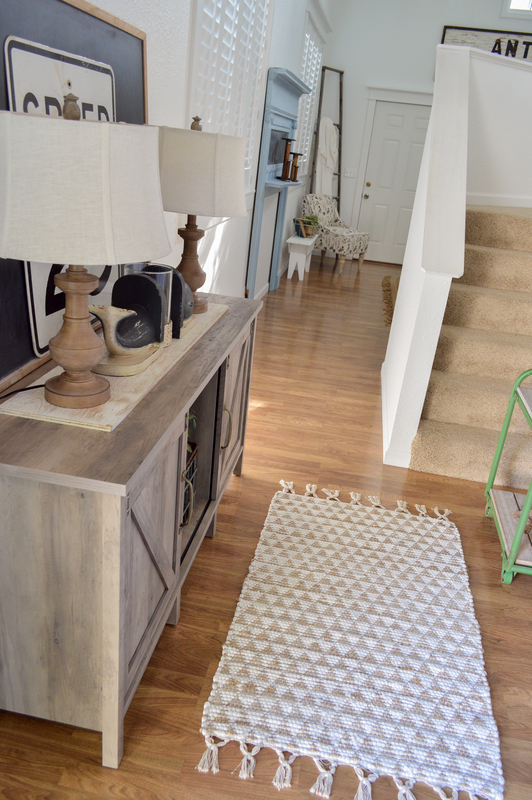 THE REQUIREMENT: I needed a furniture piece that had hidden storage & style. I decided on the Farmhouse TV Stand. 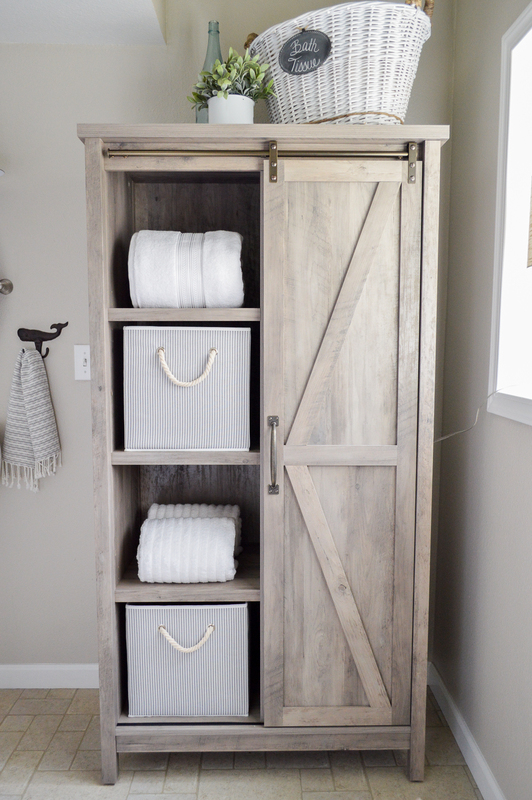 It kind of made perfect sense, since it’s from the Modern Farmhouse Collection, just like the Farmhouse Storage Cabinet that is used in the bathroom as a linen closet. 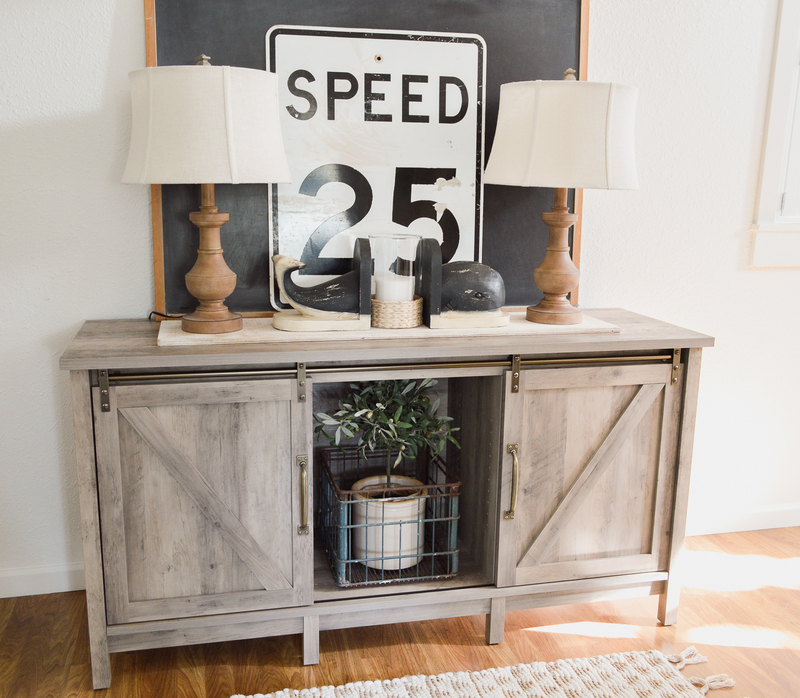 It’s touted as a TV stand but it screamed “entryway console” to me! It had style, it had flair, I put it there… did you say that like “The Nanny” Oh good. Me too. 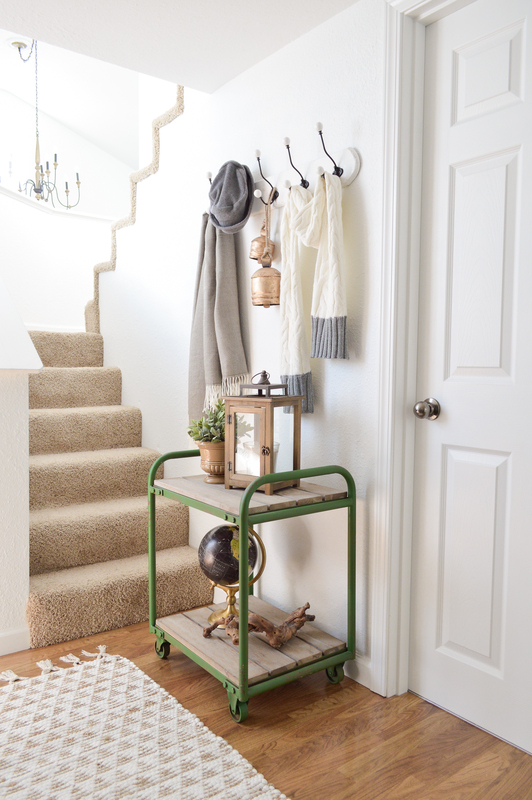 But seriously – Measure your space & measure potential furnishings. Use cardboard cut-outs, or yarn outlines, whatever you need to do to make sure you’ve got proper clearances. 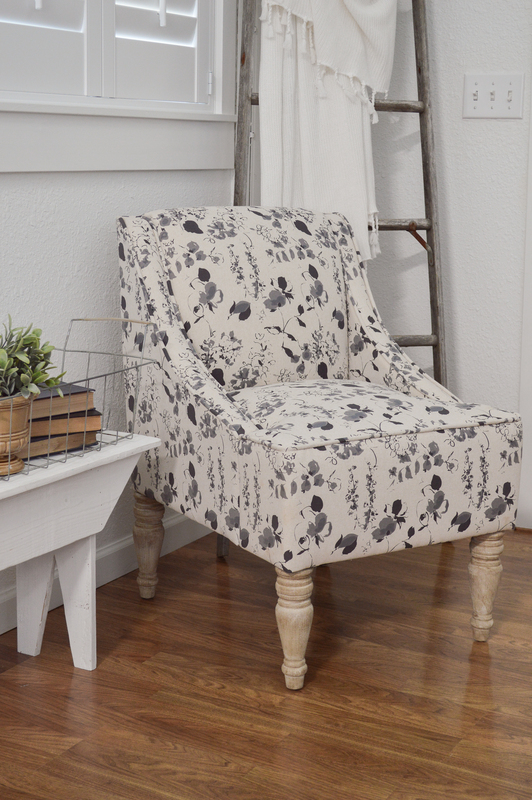 It’s the smartest thing you can do when ordering large pieces and making big changes. I measured to make sure I had proper length for my door to fully swing open, and to make sure that the piece I selected was not to deep as to hinder walking thru past the stairs. Check and check. At 62 inches long and less than 20 inches deep. It’s perfect. VERSATILITY IS A BONUS: This beauty come with 6 adjustable shelves and you can use (or not use) them however best fits your needs. I love that! As you can see, I skipped them in the middle and filled that section with some decor instead. If you were using it as a TV stand, shelves could hold electronics instead. And you’d still have two barn-style doors to hide stuff away! Because of it’s location, mine will hold things like city maps, extra hats and gloves, magazines, and “guest” type goods. IN STYLE! Because look at those cute new baskets! And they are collapsible. They just boop, boop, boop.. pop-up and go together. Or back down if you need to store them. I like that. NOTE: I bought the baskets in-store and I’ll add the link if I can find them online! The had them in natural/black and natural/navy. And because I love symmetry, I bought two matching lamps to sit on top. And because I’m cheap… I stole the harps & shades of a set I’m not using at the main house right now. Double win! 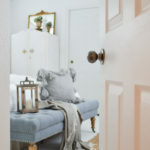 LIGHTING IS SO IMPORTANT: I love having softer lighting for this space. It’s got two pot lights in the ceiling, but when company is coming I like to turn ambient lighting for a warmer, more cozy welcome. And leave one on at night for safer trips to the bathroom, for guests staying in a strange place. I may move Moby and the hurricane when company comes. It’s nice to have somewhere to set your cup after a coffee run, or someplace to toss your keys. But he’s fun for now. Remember what I was saying about measuring? Yeah… well, I forgot. 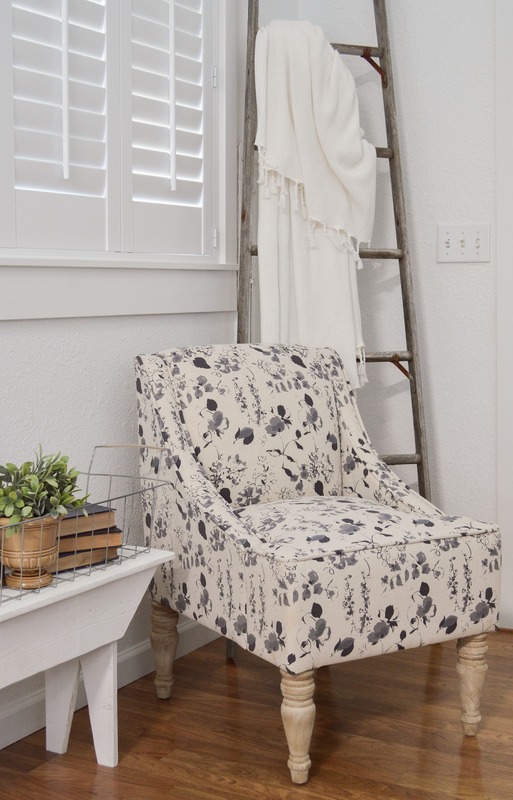 Normally, I love to tuck a chair at the bottom of the stairs so guests have someplace to sit and put their shoes on. And so I ordered that darling little number with the cute legs you can see off in the background there. It had the perfect lines and a light profile, being armless. Not too big, and not too visually heavy for the space. I loved it! Well, it’s a bit longer than I anticipated, and I felt like it stuck out into the thruway too much. I could make it work, but I want a comfortable feel, not crowded. Since I didn’t want this spot totally naked, I popped the little green cart here for now. See? Isn’t she so cute? I fell hard for those white-washed turned legs!! Now, I do have to say, it’s listed as “blue” online but to my eyes, it’s grey. Three shades of grey. One, when next to a steely blue, may look a tinge blue, but it’s grey to me. Just FYI in case you love it too. It’s fine for me. Because that only makes it… say it with me – “MORE VERSATILE!” LOL. And we all know that is my favorite feature. She’s looking pretty in the living area for now, just as if it were meant to be! Overall I’m loving it! 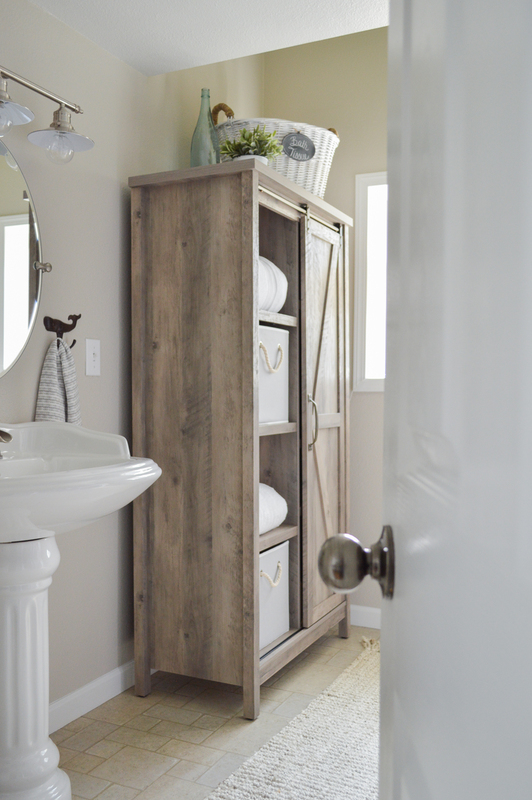 The continuity between the two pieces coordinating in the entry and the bath looks great when you walk in! I wish you could see both spaces at once. 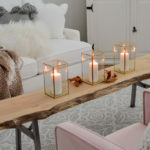 I sincerely enjoy the opportunity to share how I use the Better Homes & Gardens line from Walmart in our home with you! It’s important to me that this line fits most of our budgets and we can all feel inspired by the great design and affordable prices. Some of the links to the products and items I used are affiliate links. That mean I may make a very small commission if you choose to buy something, but you’ll never pay a penny more for it. 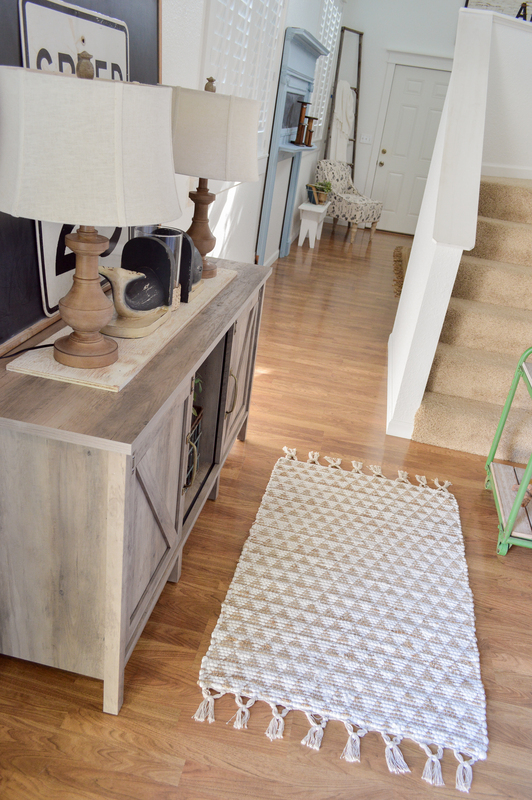 I ordered the new entryway piece, both lamps and the chair online and had them delivered to my door. So don’t forget the online shopping option for Better Homes & Gardens [click here]. It’s super handy (especially for the heavy stuff!) and the selection that way is much greater than you’ll find in any individual store. Happy Homemaking! You certainly create the most beautiful and functional spaces! Beautiful Shannon!…and love that chair too! I’ll share a close up of those in the next few months, and share details of the trim design and such. I’m behind a bit behind on that… yikes! 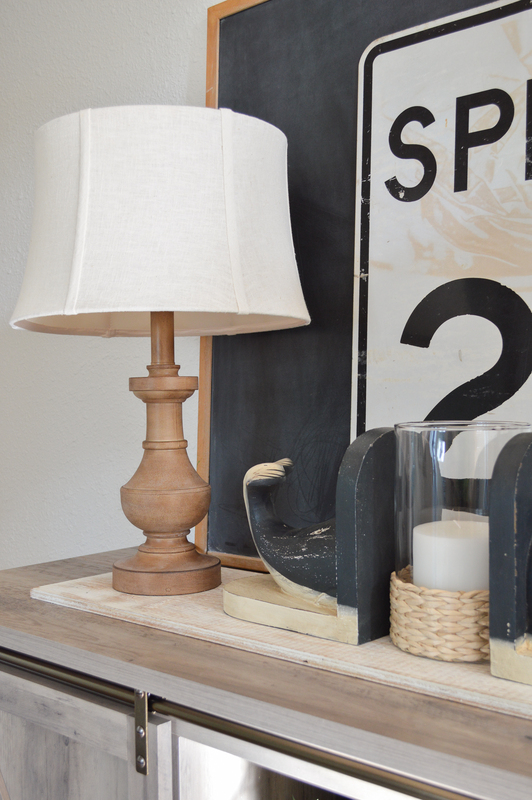 The farmhouse collection has so many cute pieces. I like them all!! 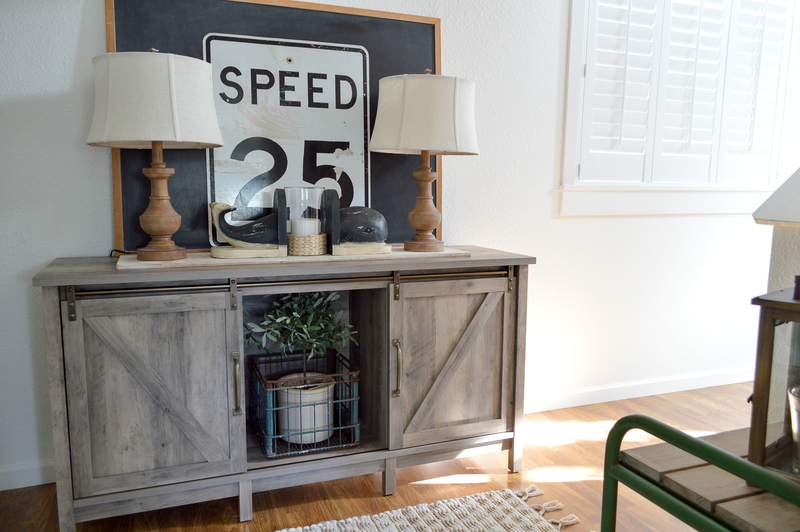 Just love those modern farmhouse cabinets! Very lovely. I’m so in love with the sliding barn doors. You have a great style, and it gives me such nice ideas! Me too! 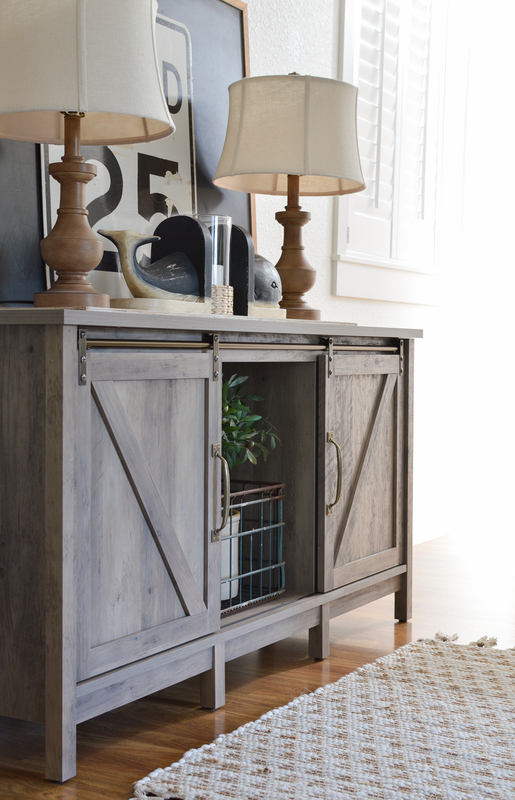 The barn door accent is such a fun feature of these pieces. Love this, friend! The console is perfect there! 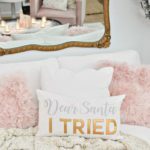 Everything looks so welcoming and amazing … your accessories and BHG pieces are fabulous, and have me looking around our home for spots to add them, too! Thanks so much Becca! 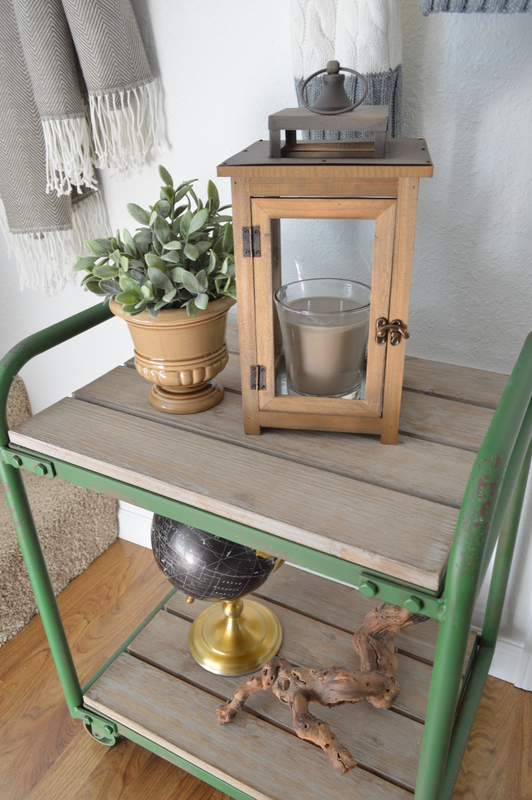 The farmhouse collection is extra cute, and I love that the 2 pieces match. I’ll have to do a live soon and share the space for a better feel on video. I feel the same way! This style of furniture (in a box) has come a long way!! I enjoyed your post and do want to thank you for putting me wise to BHG items at Wal-Mart Mart. Not a lot of shopping choices where I live and you can’t beat store pickup on smaller things either! Moby is too cute. Oh Karen these are exactly the kind of comments I share for! I feel the exact same way. Small town. Very few stores. YES! Store pick up and delivery to my door are very much appreciated by me as well. Thank you, I just love him (Moby). So cute! 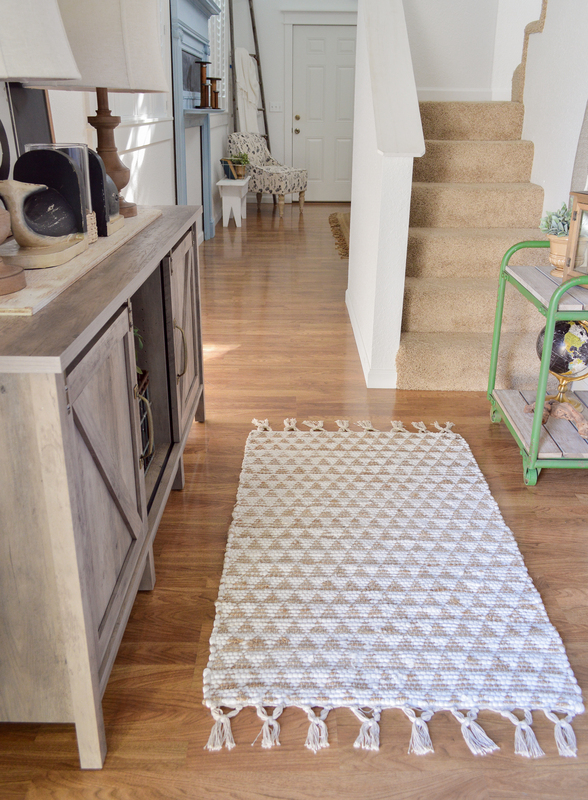 I love the runner/rug in front of the console. Do you mind if I ask where you got it? Have a blessed day! I NEED that green cart. Where did you find it? 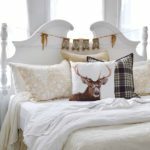 Hi Jan, I got that from the daily deal site called Decor Steals. It’s never come up again, but I watch fro it daily so I can alert y’all if it does! You have such a wonderful style. I truly enjoy your posts to see what creative thing, design or concept you come up with. 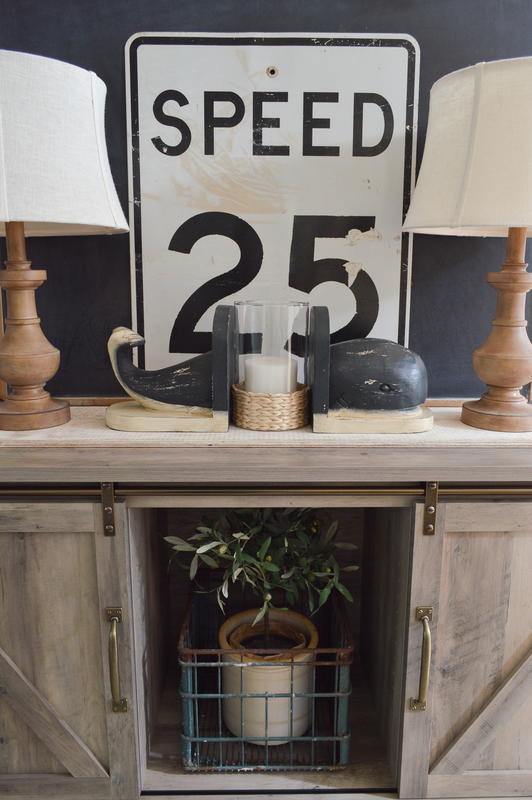 I love the additions you added for storage and functionality but my fav has got to be your styling for the top of the entry way table. 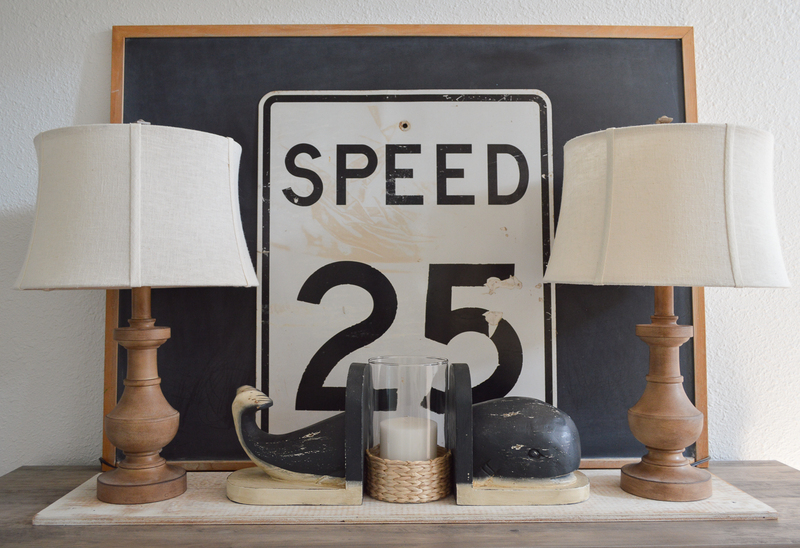 Moby, the hurricane, the speed sign and lamps are the best!! Thank you!! Comments like this mean so much!! 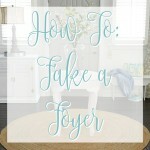 It’s so easy to doubt yourself when you see as many great spaces as I do blogging. Just goes to show we need to listen to our inner voice and do what comes naturally. Have a wonderful day!! Where is the sweet chair from? Also from Better Homes & Gardens at Walmart. It comes in two colors, I selected the “Blue”, which looks just like my photos, more on the grey side. Your entry looks amazing, love those doors on this piece! Pretty storage is a plus, entries can get messy, I love hiding gloves, shoes, etc. Thanks so much Debbie! It is. I like spaces I can tuck things and not have to see them. 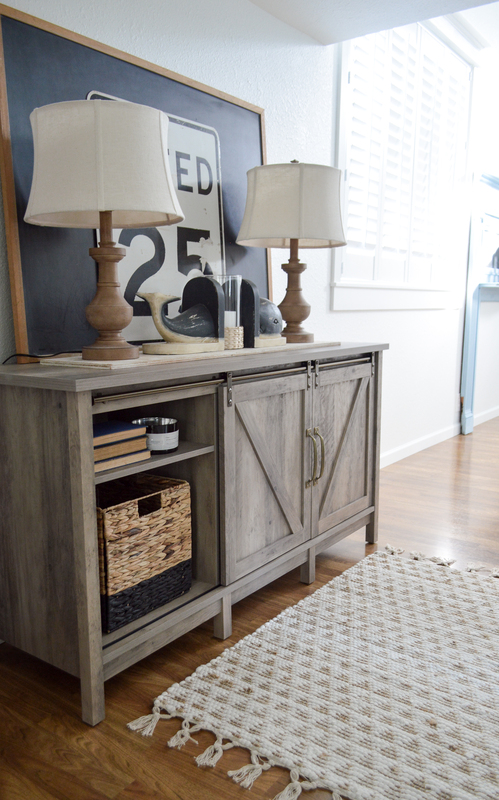 Hidden Storage With Style Cottage Farmhouse Entryway - I needed furniture with storage that looked good and worked hard. I found it, with Better Homes & Gardens, at Walmart - The perfect blend of cottage farmhouse charm + function... at an affordable price!